Kien will get rid of the spots, and we will sleep again. Everything is temporary. Actually, he has been getting better, sleeping more than a sleep cycle without crying, and I have been getting more sleep. But the spots are still everywhere on his little body even though they are now in the "crusty" phase, which means he is no longer contagious. BIG YAY! I look at his scabby little face smiling at me and I remind myself he will heal and be back to his usual looking self, before spots (and when Mama doesn't look so worn out either). We went visiting on Xmas eve to my friend Linda's. 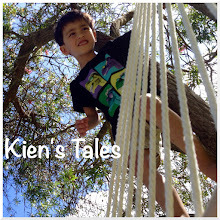 Kien got to play with his old chum Flynn, who absolutely adores Kien, and vica versa. They played nicely together; Flynn read books to Kien, banged around toys together, and chased each other around the house. They held hands as well as hugged each other. Really precious to watch. Jef has been spending a bit of time fixing the yacht, and when summer finally kicks in properly with some sunshine we may be able to go sailing (after accomplishing mission number one - taking it off the mooring). We also intend on going up north before we head back to work next week. Here's hoping things pan out nicely.